3 Bedrooms, 2 Baths Sleeps 8 maximum. 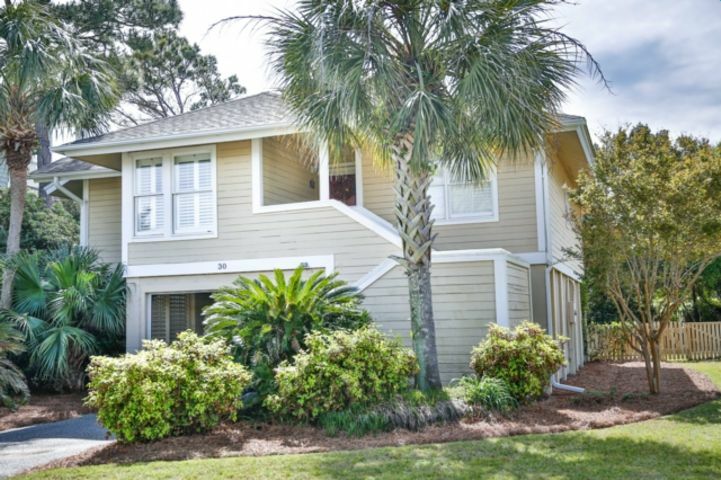 The Beachside community is situated centrally on the Isle of Palms but away from the traffic of Palm Boulevard. Our guests enjoy the privacy within Beachside as well as our community pool and tennis facilities. This neighborhood is right beside the county park, which is the only lifeguarded section of the beach on the island. This home has several New Furnishings, Plantation Shutters, Dining Area, Fully-Equipped Kitchen, C/AC, DVD/VCR Player, Wireless Internet, Microwave, Large Den, Beach Shower, Sundeck, and a Porch with a Dining Table. Pets are considered with a $200 pet fee, applicable pet policy signed, and records received prior to arrival. Dog must be approved by Carroll Realty. This house also does a winter rental from Mid-September through Mid-May! Please contact us if you are interested! C/AC, 2 TVs, DVD/VCR, FULLY-EQUIPPED KITCHEN, W/D, D/W, BEACH SHOWER, PLANTATION SHUTTERS, LARGE DEN, SUNDECK, PORCH W/ DINING TABLE, WIRELESS INTERNET, COMMUNITY POOL & TENNIS, BED SIZES: 2Q, 2S, QSB - LINENS ARE PROVIDED. This was the most dissapointing rental for our family in 30 years. the house was NOT clean. the kitchen floor was filthy and the cookware was just awful. You cannot expect a repeat visit when the dishes and pots look like they were not cleaned. A kitchen cabinet door fell apart and the repairman who came just took it away and did not return. The amount of dirt under the rugs could be swept up with a trowel. I will under no circumstances recommend the rental or Rental agency to anyone. Horrible!!!! Great beach house, family friendly. Location was great with easy beach access. Charming and comfortable, with plenty of indoor and outdoor space. However the house needs some owner attention to the details - locks and lights that don’t work, bathrooms need a deep clean, outlet faceplate missing, no way to open large blind and AC in one of the bedrooms didn’t cool well. Master toilet didn’t flush well. Last, there were extra bed pillows but no pillow cases. We have stayed at 6 houses in Beachside over the years. This home is by far our favorite. Well appointed kitchen, comfortable beds, and overall cozy feel to home, not to mention it is dog friendly. We will stay here again. Great location! Disappointed with customer service. This house was really nice and a superb location. Just a couple minutes walk from the beach or pool, and close to lots of local restaurants. (Many of them walkable by the beach). It's only a 25 minute drive to Charleston as well and we enjoyed exploring that city as well. What was disappointing, is that on Monday morning we woke up to water all over the kitchen floor and everything was melted in the freezer. It appeared that the refrigerator was broken as well. We had lost all our groceries and had to go buy another round of food. We called the property management company and did not receive a callback until Tuesday. At that point they said they would send someone out to fix it. Fortunately, the fridge started working again on its own so we put our groceries back in, but then broke again the next morning! On Wednesday we had not heard back about getting it fixed so we called again. They said someone would be there on FRIDAY! We told them we had lost 2 loads of groceries due to the issue and they advised us to buy ice and use the cooler in the garage. Meanwhile it would be 4 days since we called that they were able to attempt to fix the issue. It truly was a wonderful vacation and the house/neighborhood/location was perfect for our family, but this was a poor experience on the service side of things. Great location and priced perfectly! We booked this house very last minute for an end of summer get away and loved that we were able to stay from Tuesday-Sunday rather than booking an entire week. The three bedrooms were perfect for our family and we loved the location with pool and beach access. If I had to come up with one complaint - I would say that the master bed wasn't all that comfortable - but I guess that's just a personal preference. We definitely recommend this location! furniture. I was pleased to see a fenced in yard for dogs and a wagon with beach chairs. Rates are subject to change until reservation is confirmed with a Carroll Realty employee. 50% payment is due within 5 days of making your reservation. Final balance is due 30 days prior to arrival date. We accept Visa, Master Card, or Discover or personal check if more than 30 days from arrival. All reservations are charged a non-refundable $45 damage waiver which covers accidental damages up to $1000. Cleaning Fee is waived when staying 7 nights or more. We book weekly only during the summer months from Saturday to Saturday. 3 night minimum any other time. Pet fees, if applicable, and damage waiver are non-refundable. No exceptions. Cancellations: After you have made payment, you will receive a refund minus a $50 fee only if the property is re-rented for the same time and price. We also offer travel insurance. There are 2 different plans: one is the traditional All Seasons Plan for an additional 7% or we also offer the Cancel For Any Reason plan for an additional 10%. The cancel for any reason plan must be purchased within 10 days of making the reservation. The other plan can be purchased any time prior to 30 days before your arrival. Please note: Travel Insurance should be booked and paid for through Carroll Realty, or through a link we can provide to you after booking.